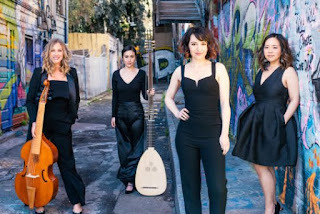 Last night at the Episcopal Church of the Incarnation in the Sunset district, Sunset Music and Arts presented a delightfully fascinating program entitled Early Music Meets New. The performers were the members of the Liaison Ensemble early music group, mezzo Melinda Becker, harpsichordist Susie Fong, cellist Hallie Marshall-Pridham, and Tatiana Senderowicz on theorbo. Their repertoire included songs by two seventeenth-century women, Francesca Caccini and Barbara Strozzi. 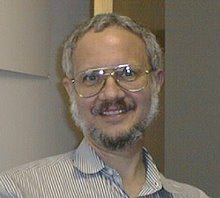 However, most of the program was devoted to the “new" portion of the title, presenting four recent compositions for Liaison’s instruments. These pieces were created under the auspices of the Helia Music Collective, co-founded by composers Julie Barwick and Emma Logan, who contributed two of the works on the program. The other two were written by Emily Koh and Lily Chen. For those readers who have not yet noticed, all participants in this program (including those from the seventeenth century) were women, making last night’s performance following the 2019 Women’s March during the day a fortuitous succession of events. Each of the new works amounted to a “response” to the “call” of one of the older selections. Thus, during the first half of the program, Koh’s “am burning, have burned, will burn” served as a “response” to Caccini’s “Ch’amor sia nudo” (that love is naked). The result was a pair of complementary takes on Cupid with sharply contrasting rhetorical stances. The second half presented two such “responses” to Strozzi’s “L’Eraclito amoroso” (Heraclitus in love). The “call” involved a brief introduction followed by the traditional “lament form,” based on four descending steps in the bass line. Logan used this structure as a point of departure to set a complementing love poem by Fenton Johnson, “In the Evening.” Chen, on the other hand, deconstructed the underlying structure for “something completely different,” entitled “Fragmented Lament.” This required Becker to pursue several “alternative techniques,” including singing through a bullhorn. The program began with a reversal of “call” and “response.” Barwick created Songs of Ice and Fire as a cycle of three poems by Amy Lowell, the last of which, entitled “Opal,” begins with the line “You are ice and fire.” (Are you there, George R. R. Martin?) The intensity in Lowell’s word choices and Barwick’s keen awareness of her rhetoric then served to introduce the first Caccini song on the program, “Che desir di saper che cosa è amore” (to whoever desires to know what love is). Both text and music followed a more conventional strophic form, but Becker’s delivery made it clear that the intensity of emotion in the seventeenth century was as strong as it was in the twentieth. Taken as a whole, this made for a relatively brief program. However, the diversity of the offerings was so extensive that anything more could easily have taxed the ability of mind to take in any more imaginative novelty. Indeed, this is the sort of program that needs to be experienced more than once to appreciate the full extent of its richness. On the technical side, Senderowicz seemed to have trouble balancing the amplitude of her theorbo against Fong’s harpsichord work; but she gradually worked her way up to a more assertive sound as the evening progressed. Marshall-Pridham brought a rich sound to her cello work and a solid foundation for her instrumental support in the lament form. Becker’s vocal talents were notably expressive, particularly in light of the wide diversity of styles that she had to negotiate. At the Met: Nothing Succeeds Like Excess? Salonen at Davies: A Taste of What’s to Come?